I’ve been researching Hibbses– not an easy task. The Hibbs family is very old and very large. Our Hibbses first came into Ohio in 1815. Isaac Hibbs (wife unknown, but possibly Elizabeth Cuppy) and his sons Samuel, Joseph, and Isaac Jr., and Daughter Nancy. They purchased land in Jefferson county (now Loundon Twp. Carroll County), and are listed as “Entrymen,” or original landowners in Carroll county. Isaac’s wife, Mary Lucas, died in 1828, and is buried in Kilgore Lutheran Cemetery. During the 1840’s, Isaac Jr. (now remarried to Julianne Mathews), Step-daughter Isabella, and his two sons Mahlon and Isaac (III) purchased land and farmed up in Oldtown Valley (Co.Rd. 24). Isaac Jr. died in 1858 and is buried in Forney Cemetery (now on private property) up in Oldtown. Isaac and his wife Margaret Markley returned to Carroll County where he later served in the Civil War as a member Co. K, Reg. 98 of the OVI. Mahlon and his wife Eliza Ellen Wise stayed in Tuscarawas County and raised their six children, Harvey, Thursa (m. Daniel Meese), Enos, Almeda (m. Phillip Heldt), Charlotte, Isaac George, William, and John. Mahlon eventually left Oldtown Valley and moved into Lehn’s Valley (now Wainwright) where he had a small farm up where Sani Rd. now goes. Mahlon and Eliza were membeers of st. James Lutheran Church in Tuscarawas. Both are buried there. Mahlon and Eliza’s oldest son, Harvey (m. Anne Elizabeth Kuhn) lived where Bob and Wilma Briggs now live. Harvey and Anne’s children were George William (m. Emma Farrell), Emma (m. Charles Toben), Ida May (m. Frederick Davis from England), Lucy (m. Joseph Mathias), Albert (m. Clara Hancy), Anne (m. William Ashbaugh), Ella (Ellen Irene) (m. August W. Brieske (Broeske)), Caroline (m. Harry Owens), and Mary (m. Evan Francis). Harvey and Anne purchased a farm near Alliance where they continued to farm. 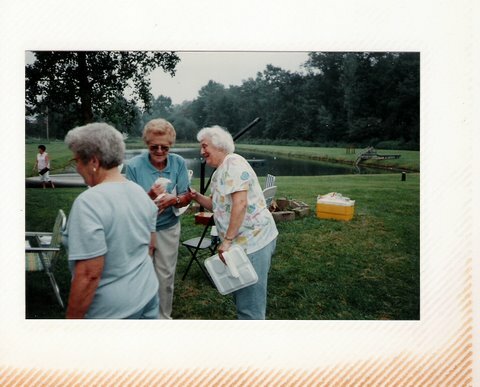 Eventually, they relocated to Geauga County with Emma and Lucy. Harvey died in 1919 and Anne in 1923. Harvey and Anne Hibbs, the Tobens, and the Mathiases are all buried in Overlook Cemetery in Parkman, Ohio. Beat eggs with salt and gradually add flour. Roll very thin. Allow to dry approximately 30 minutes or until edges feel dry. Roll sheets together and slice very thin. Cook in broth or use as you would dry noodles, watching cooking time. These noodles will cook quicker than store-bought noodles.